2 "WAKE UP DEMOCRATS! Take Back the Country"
Lila Garrett is a longtime activist, and award-winning screenwriter. She hosts “Connectthe Dots” on Pacifica’s KPFK in Los Angeles. She was Southern California Chair of the 2004 Kucinich campaign, and past president of Southern California Americans for Democratic Action. She has served on the boards of the ACLU, the Venice Family Clinic and the Writers Guild of America. She founded Americans against War in Iraq, and is a founding boardmember of the California Clean Money Campaign. As TV-screenwriter, producer and director, she has won two Emmys and the Writers Guild Award. Lila Garrett serves on the Advisory Board of Progressive Democrats of America. 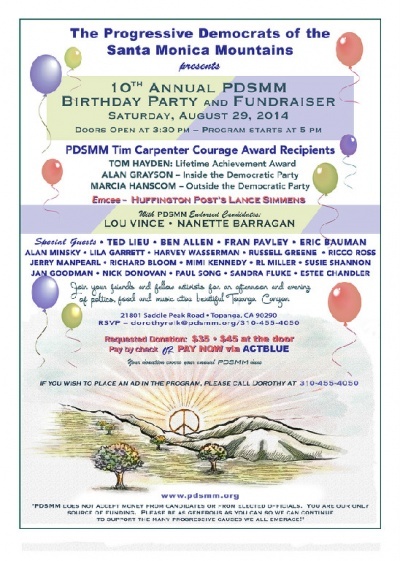 Special guests - Ted Lieu, Ben Allen, Fran Pavley, Eric Bauman, Alan Minsky, Lila Garrett, Harvey Wasserman, Russell Greene, Ricco Ross, Jerry Manpearl, Richard Bloom, Mimi Kennedy, R.L. Miller, Susie Shannon, Jan Goodman, Nick Donovan, Paul Song, Sandra Fluke, Estee Chandler. Aris Anagnos, John Amato, Cindy Asner, Ed Begley, Jr., Tom Coleman, Frances Fisher, Lindsay Gardner, Jan Goodman, Lila Garrett, Howie Klein, Jerry Manpearl, Scott Mayers, Sara Nichols, Rick Overton, Dorothy Reik, Frank Reyes and Eloise Reyes, Paul Song, Ron Stone, Patric Verrone, Marianne Williamson, Roger Wolfson. (Host Committee in Formation) - In Support Of Congressman Alan Grayson for U.S. Senate 2016. Sunday August 30, 2015, The Lantern House Venice, CA. This page was last modified on 29 November 2017, at 15:40.